And finally, Winnie & Walter Join In To Win, where this week's theme is thank you cards. I stencilled Evergreen Bough and Scattered Straw distress inks through the Cubist stencil on a white card panel, stamped some Dandelion Dreams in Versafine Onyx Black, then stamped 'thanks' so that it crossed the dandelion stems. I sponged the edges of the base card, then added the panel, and topped it off with a die-cut butterfly stamped with Butterfly Wishes in distress ink. Beautiful, I love the combination of colours. Great card, I love the big bold sentiment and the colour combo is brill. Excellent. Great colors and arrangement. Fabulous colors -- love this card! Wow! And, I mean Wow!!! I love your stenciling on this card, Shirley! Gorgeous color combo, and I love the butterfly! Your black and white dandelions and sentiment are really perfect, too! SUPER beautiful, Just amazing color choices Shirley! --and the stenciling, OMG!!! Congrats on the Seize the Birthday DT, you deserve it !!! Gorgeous design, love it ! That stenciled background is seriously gorgeous with your inked butterfly, Shirley! 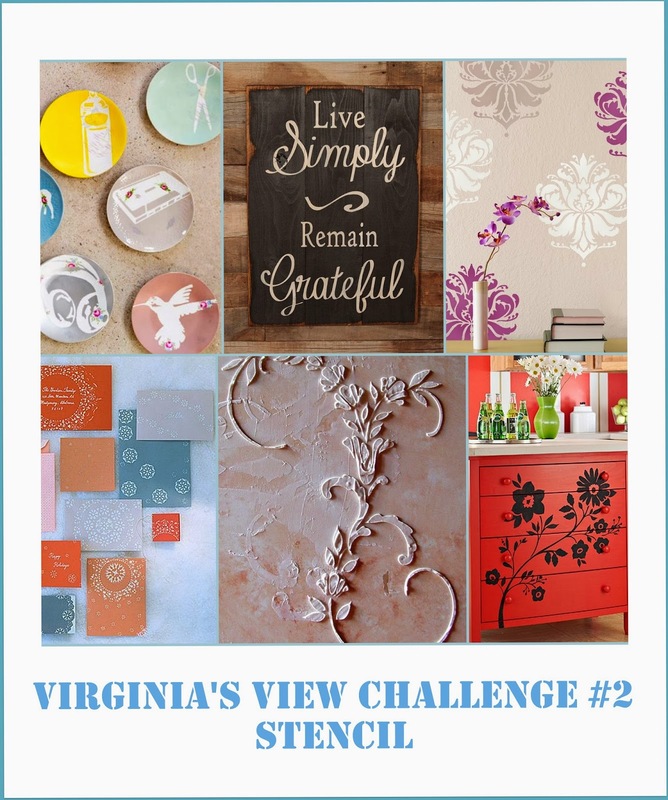 Thanks so much for joining the fun over Virginia's View Challenge! Oh yeah....winner, winner! Gorgeous stamped image, perfectly paired with the awesome stencilled pattern and a pretty inked butterfly! I LOVE that Dandelion Dreams stamp! Gorgeous colours and great use of the stencil! Wow this is truly stunning!! Seize The Birthday Design Team!